So, it’s 1959 and Don and Sal, the art director, are at odds about the new Gibson ad campaign and are flying to Kalamazoo to straighten out the f-hole issue. Don’t even think of making the joke. This real nice 59 ES-330 has red paint in the f-holes. Why would someone do that? but only where the f-holes are open. The odd thing is that the factory stamps-model number and FON-are on top of the paint. That can only mean they were done at the factory. The FON goes on before the guitar is glued together. So why would the nice folks at Gibson paint the inside of a guitar red? The owner had bought the guitar from a reputable dealer and I asked if he had any insight into the red paint. The dealer’s explanation made pretty good sense. Most of you are old enough to remember black and white photography using this stuff they used to call film (“fillum” where I come from). Well, black and white film is a somewhat finicky medium. Certain colors come out too light and certain colors too dark. This is important in product photography. The inside of the f-holes on a thin body guitar would reflect the light back and look white in a photo. They needed a somewhat darker tone. 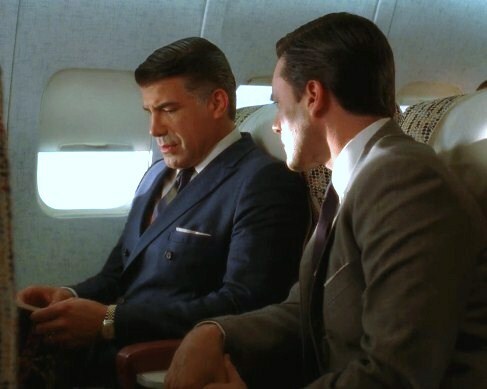 Remember, there was no Photoshop back then-this the “Mad Men” era. Apparently this tomato soup red color was, as you might expect, pretty handy and apparently gave them a pleasing darker tone that looked right in the brochure and in promotional photos. I went and found a scan of the 59 catalog and there was no 330 in it at all. 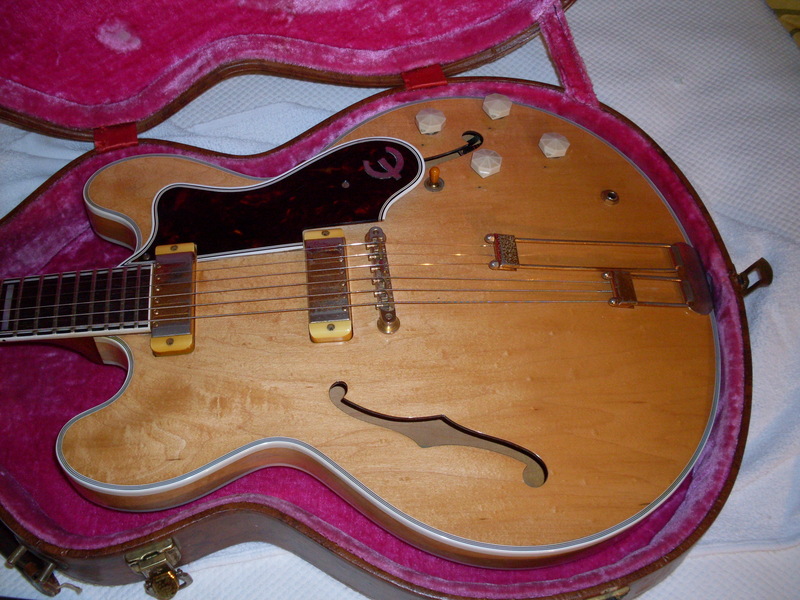 The ’60 catalog only shows a single pickup (although it mentions the two pickup model). So, this guitar is apparently not the brochure guitar but the explanation kind of makes sense, so I thought perhaps a little experiment was in order. I don’t have any black and white film (although I still have a film camera) but I do have a couple of ES-330’s that I can shoot digital photos of and turn them to black and white. I know, not quite the same thing but I’m limited by the tools here. The photos below kind of make the point. The one with the red looks better than the one without it to my eye. The raw wood inside the guitar reflects the light and looks a little unfinished while the red one makes the f-holes less obvious so you concentrate on the guitar rather than the f-hole. Whether anyone actually buys into the idea that it makes a particle of difference to the potential guitar buyer is up for debate. They do focus groups on this kind of stuff and it’s a great way for the focus group people to make money. Also a great way for art directors to keep their jobs. Also a way for Gibson to justify a higher price for a guitar to cover their “R&D”. Here’s the 330 with the red paint. Looks nice in black and white but is the red paint really necessary? Look at the photo below and decide for yourself. Here’s the guitar without the red paint. Compare to the one above with the red paint. Not that different but different enough for the art directors to squawk. I’ve worked with a lot of art directors and I’ve seen them storm out of the room over a lot less. This 59 “beater” was one of my favorites but it wasn’t exactly cheap. Well, cheap for a blonde, I guess (and I’ve known some cheap blondes in my day). 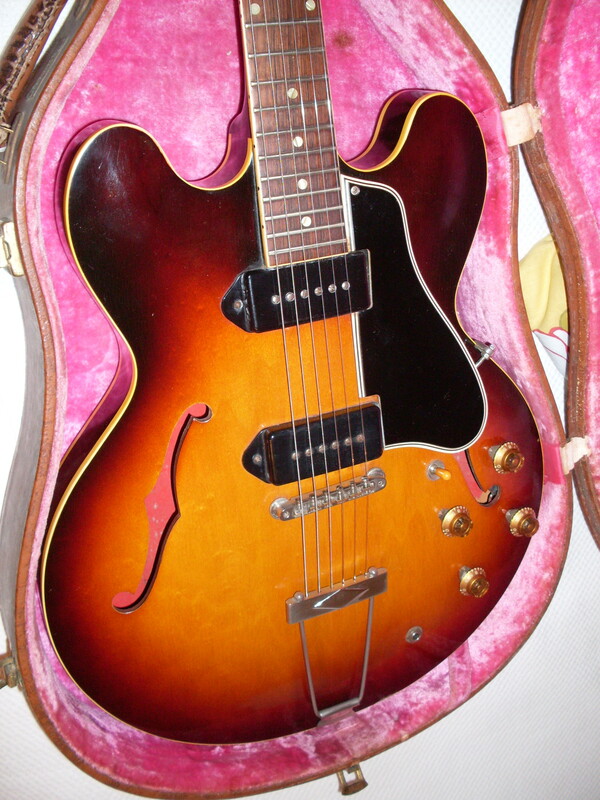 It’s probably had 3 or four fret jobs and the neck bindings replaced, most of the finish is missing from the back but it was $35,000 less than the price of a collector grade ’59 ES-335TDN. Fifty or sixty years is a very long time. OK, not in the sense of the history of the Earth or anything but it’s a long time for me and for a guitar, among other things. Stuff gets old, stuff gets used, abused and thrown away. When’s the last time you saw a 1961 Chevy at the local Starbuck’s? The old car business is a little like the old guitar business with at least one notable exception. Cars rarely get used for 50 or more years without being restored (unless you live in Cuba). It makes little economic or practical sense to keep a 50 year old car running as your daily driver. On the other hand, a 50 or 60 year old guitar that been played its entire life might be the best playing, best sounding guitar you ever played. It just won’t look that great. The main factor is probably the number of moving parts. A guitar doesn’t have very many so it might show all kinds of player wear but the parts that actually wear out are limited. Frets, tuners, nuts, bridges and pots are the parts that tend to go and all are relatively cheaply replaced. 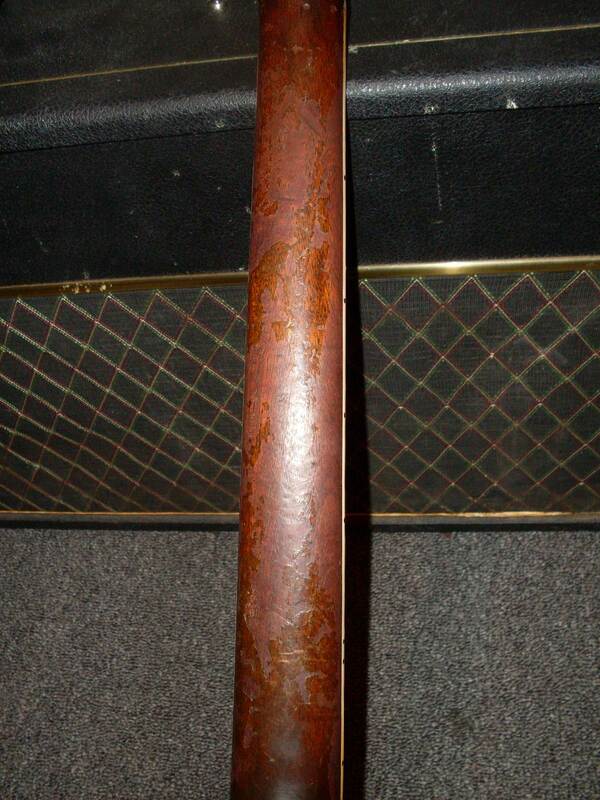 A warped or twisted neck will put a guitar out of commission but little else will. In fact, the first thing I check on a “mint” guitar is the neck. The biggest reason a guitar goes back under the bed for 40 years is that it doesn’t play well. I might add that the biggest reason a guitar gets played year in and year out is because it DOES play well. I know, it’s a cliché but the good ones really do get played. The bad ones get played too and some good ones don’t get played but, on average, beaters are better players than mint guitars. That doesn’t mean a mint guitar is inferior but if a guitar is being played, its probably set up properly and doing what it’s supposed to do…play well and sound good. A guitar that’s sitting under the bed doesn’t have to do either. This 61 335 must have been played a lot. Neck wear like this – even after 52 years-doesn’t happen unless someone is playing a lot. We’re all familiar with guitars that have been played so much that there’s almost no finish left (like the Rory Gallagher Strat) and with guitars that have had all their parts replaced, although many ES’s have been scavenged for parts by Les Paul owners. It’s pretty typical for ’59 and ’60 ES-345’s to have splices in the pickup leads because somebody swiped the double whites for their R9 Les Paul. But the beater has a great deal of allure for many. It’s a sign that the guitar has a history and, more often than not, a sign that the guitar was played by someone serious who probably gigged regularly and relied on his instrument as a means of support. That usually means two things: Great player and cheap. And really, what more can you ask for if you aren’t buying an investment? Excessive wear doesn’t really affect playability and tone. A well executed headstock repair usually doesn’t either, although some would argue the point. Neck reset? As long as it was done properly, it won’t make the guitar sound any different although it will make it play better. The typically changed parts don’t make much difference in tone either. I routinely put repro or Tone Pros bridges on my players-a worn or partially collapsed bridge doesn’t do your tone or sustain any favors. A worn nut can be deadly to your tone and slipping tuners are simply a pain if you’re a gigging player. We could argue about changed pots but I don’t think it makes much difference. Pickups are another story. Myself, I try to find beaters with correct era pickups, at least. Not that some aftermarket pickups don’t sound great but I just like vintage better. So, what should you look for? Well, cheap for one thing. What makes a guitar cheap? Issues. Holes in the guitar that don’t belong have no effect on tone or playability. 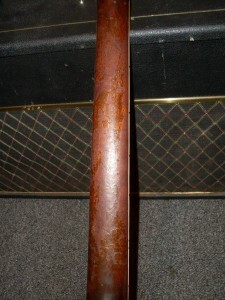 A worn finish (or in most cases, a refinish) won’t affect the tobe or playability. A bad headstock break or poor repair should be avoided as should a less than straight neck. Some problems can be adjusted away, some can be planed away, some (like a twist) are better left to be someone else’s headache. If you pick up the beater in question and you love the way it plays and the way it sounds, do you really care what its been through? I don’t. Here’s the same 61 in all its “beater” glory. A really excellent player that didn’t break the bank for a savvy buyer. Do guys like this play cool guitars or are the guitars cool because they play them? We are nowhere near as cool as George but we can play what he plays and try to be as cool. What makes a guitar cool? And is it the same thing for everyone? Vintage 335 buyers are a pretty homogeneous lot-55 to 65 years old, although there are more and more younger players-and almost always men. I’ve sold close to 300 of these (330’s, 335’s, 345’s, 355’s and Epiphones) and all of them have been sold to men. This is worth looking into but it has nothing to do with coolness, so I’ll put that aside for now but I do think coolness is generational and gender biased. I can speak for myself (and hopefully some of you) when I say that a rare or unusual guitar pushes most of my buttons. I’m sure that if most of the ES-355s made were black instead of red, that Keith Richards wouldn’t have found that black one so cool. On the other hand, we probably think that it was Keith who made it cool rather than the other way around but I think we would be wrong. The cool factor can certainly be dictated by who the player is-it’s no surprise that red 64 ES-335’s are so popular because of a Mr. Clapton but they are also pretty cool guitars on their own. He probably thought that since he bought it before he was all that cool. 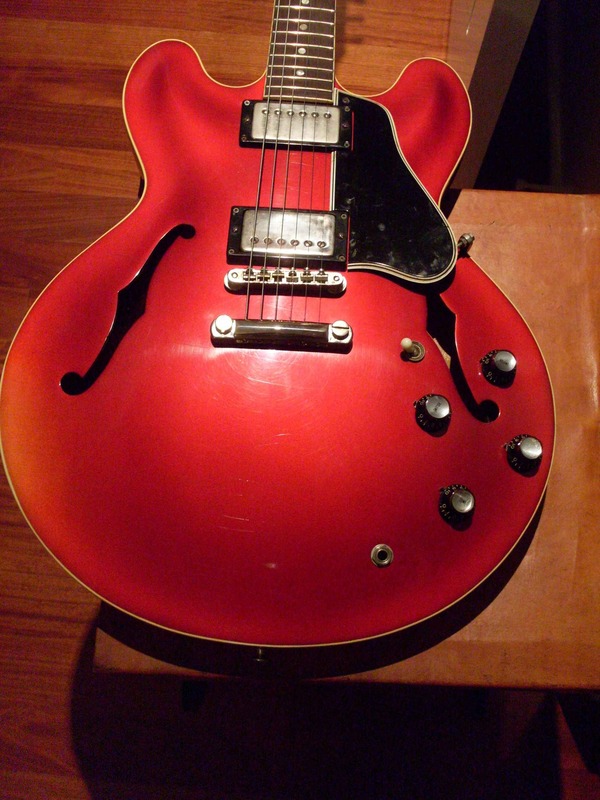 Perhaps a red 335 is not at the cool level of a black 355 but still pretty cool. 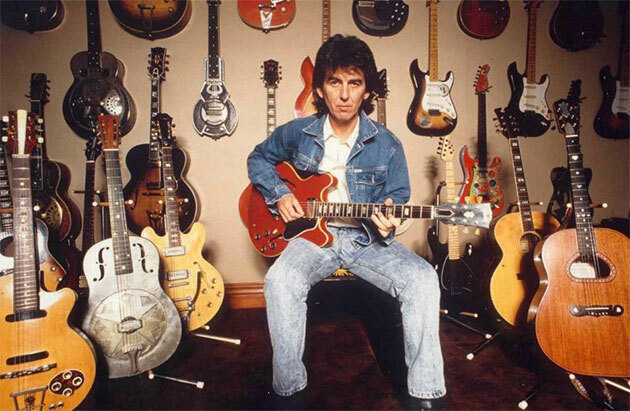 But George Harrison was pretty cool guy too and he could play anything he wanted and he played a Gretsch Gent and then an SG and an Epi Casino in the heyday of The Beatles. But he later played a very cool red Les Paul (Lucy) which, as we all know, was Clapton’s before it was George’s. These guys shared a lot, it seems. And what’s that guitar he’s playing in the photo up above? Looks like a 64 335 to me. Lucy is on the wall. So, again, which is the tail and which is the dog here? Is a black 355 or a red Les Paul cool because cool guys played them or did the cool guys want a cool guitar? I’ve met a fair number of celebrity types over my careers in film/TV and guitar sales. The one thing that is consistent about them is that they are usually just regular guys (women celebs are often a little different, it seems) who have worked hard and have a lot of talent in a given area. They seem pretty normal to me once you get to know them. Celebs also think that cool stuff is cool because its cool to them not because of them. Lots of them grew up uncool and became cool later and, unless you believe your own PR machine-which is a mistake-you still see yourself as uncool even if the rest of the world sees you as the coolest guy in the world. But I ramble. Whats’ cool? Black guitars are cool. Blonde guitars are cool. Beat to hell players are cool. Cheap guitars (like Airlines or Silvertones or Supros) are cool if you can really play. Flying Vees are cool but only if you’re Albert King-otherwise you’re a pretender. Naming your guitar is only cool if you’re a celebrity-otherwise it’s dorky. Not as dorky as naming your car, however. I don’t keep a lot of guitars for myself-I’m a shameless mercenary that way. Everything is for sale but I’ve gotten some huge response to that beater black 64 ES-345 that I was thinking of keeping for my own not terribly cool self. It has generated more interest than I’ve had in any guitar in the past year. Could it be the cool factor? It certainly checks off the cool boxes in a big way-it’s black, it’s a well played beater and, of course, it’s an ES. I thought I would share one other cool guitar and that would be this one. It’s a 59 Epiphone Sheraton in blonde. One of only 3 shipped in 59. This guitar is so cool that I’m not cool enough to play it. This could be the coolest guitar I own. There are exactly 3 ’59 blonde Sheratons. OK, it isn’t quite a 355 but I think even Keith would find this one pretty cool. I’m going to guess he doesn’t have one. This is a completely refinished 62 dot neck. Mmmm. Candy Apple Red. It was half the price of an original and is in the top five of my “best sounding 335’s ever”. I’d call it a player. If I seem like a bit of a guitar snob, your perception is correct. I’ve written over and over about how I don’t like 70’s 335’s. And I still don’t. If that makes me a snob then I’m a snob. But, unlike many collectors, I don’t turn my nose skyward at the mention of a “player”. I love guitars that have been played to death and still sound great. The conventional wisdom is, of course, that the good ones get played. My experience supports that but not entirely. I’ve had 50 year old mint guitars sound just as good as the beater that has seen it’s share of roadhouses, frat houses and houses of ill repute. But that beater is a little different in that if it didn’t sound so good for all those years, it probably would have gone out with the trash in 1978 or maybe 1992. Now that “vintage” is a buzzword, these old road warriors get hyped and sold for some serious money. Who would have thought that the biggest development in the guitar world in the past 2 decades would be guitars with fake wear? Now the real ones have “mojo” or “character” or “natural relic’ing”. It seems that the tail is wagging the dog a bit. But let’s look at what makes a real “player”. The biggest thing is that it should cost a whole lot less than a “collector grade”. Half. Less than half if it’s been broken and repaired. Changed parts? You bet. If you’re lucky, you’ll find one with the original electronics which, with semi hollow Gibsons is not so far fetched since nobody likes to mess with the harness of a semi. With PAFs being equal to the cost of a nice vacation (OK, holiday if you prefer), you can bet a set of these will jack up the price a bit. But, that said, you can always find the exact same pickups with the “other” sticker for a lot less. So (getting to the point, finally), what should you look for in a player? Well, one that you like the sound and feel of. Simple as that. I wouldn’t eliminate any modification (including access panels in the back) as long as it’s reflected in the price. The more indignities the guitar has suffered, the lower the price. I bought a 61 dot neck for $5000. I bought a 63 345 for $2400. And these weren’t bought in 1992, they were bought in the last 2 years. The dot neck had an ugly but competently repaired headstock and a few changed parts (and PAFs). 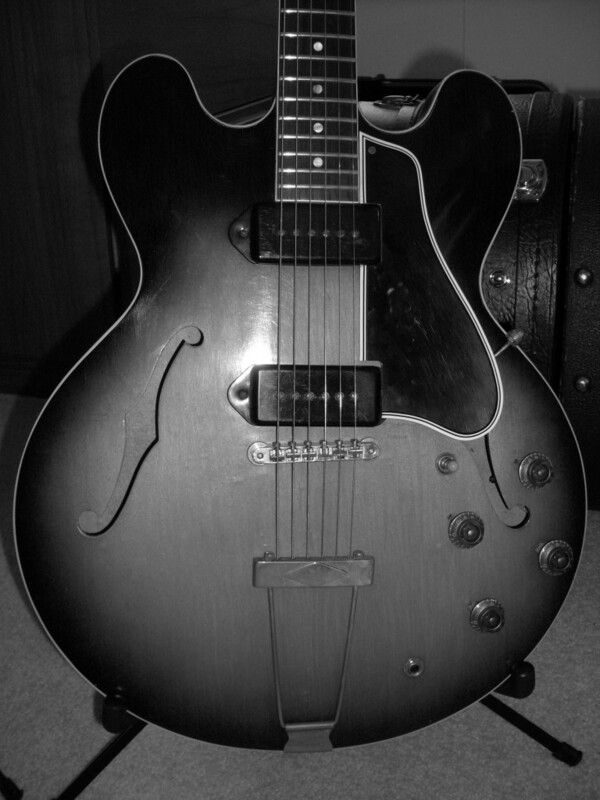 The 63 was refinished with changed pickups. 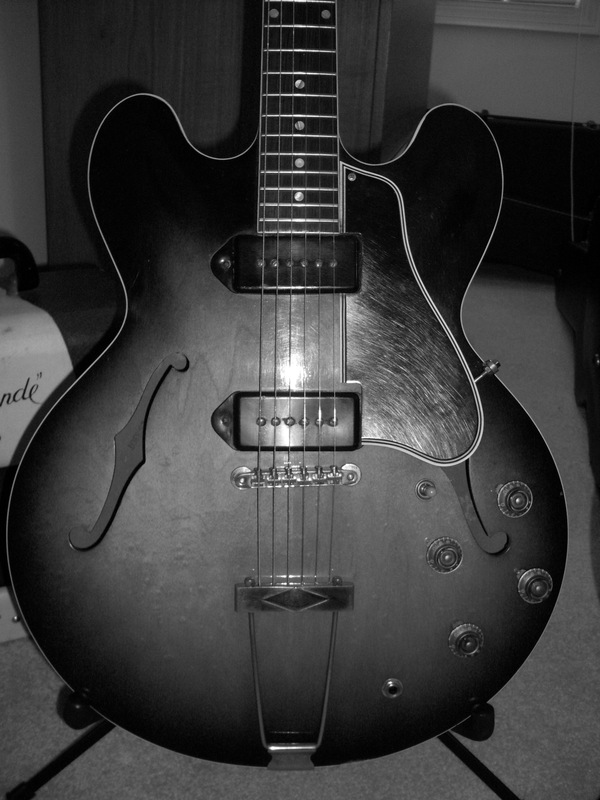 One of the top five (out of hundreds) best sounding 335’s I’ve ever owned was a completely refinished 62 dot neck. They don’t call ’em players for nothing. This morning I walked into my office and went into the “guitar closet” where I keep the good guitars and had a big choice. What was I going to play today? There’s a blonde 59 345 in there and a real nice 64 ES-335 and a 58 335 and a 59. There’s my 12 string (Taylor), a 59 330 and two players: A watermelon 60 ES-345 that’s got changed pickups, Grovers and a few holes from a Maestro. 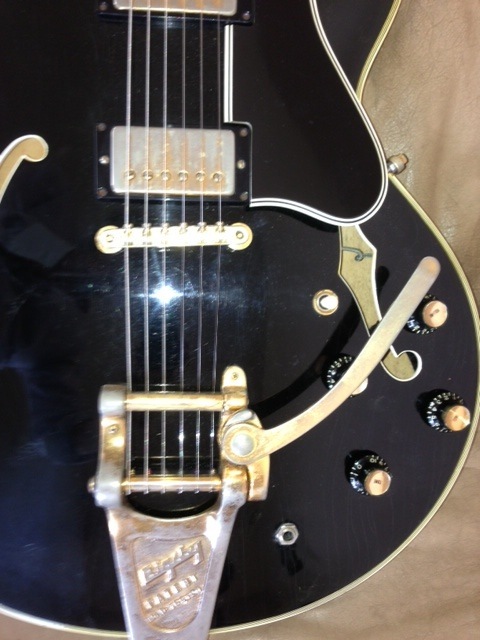 And a black big neck Bigsby 64 ES-345 with a repaired headstock, repro tuners, repro bridge, impossibly warped pick guard and a glorious pair of early patent numbers. Hmm…what to play. The 59? Nope. I reach for the black 64 and it sings to me. That ones a player. This guitar looks like its been played every day of its 50 year life. It is beat up, rode hard, put away wet and had nearly every part changed at some point. The only thing original on here is the pick guard and that’s so warped its in the case pocket. It does have a killer set of early patent numbers and it sounds like a choir of angels (on Christmas). This white ’65 ES-355 is the only white ES I’ve had. The finish was factory but it’s really tough to tell if it was originally white or a factory refinish. It did have a “custom” truss cover but that, in itself, isn’t enough to convince me it is original. You thought I was going to write about PAF bobbins didn’t you. Go on, admit it. And it doesn’t matter if they’re black or white (unless you’re buying or selling). But, no. I’m writing about black guitars and white guitars. They made both as custom orders during the 50’s and 60’s but they are rare and they are desirable. Out of 300 or so ES-330, 335, 345 and 355’s I’ve had here since I started this site, I’ve had only two legitimate factory black ones (and a couple of black Trinis but those were actually a stock color, although they are awfully rare). I’ve had exactly one white one. You would think both those colors would have been more popular but they just aren’t. Gibson made an awful lot of Les Paul Customs in black so it wasn’t like they didn’t have the paint around. They also made a fair number of factory white SG’s-mostly Customs and Specials and a few Jrs. So how is it that these colors rarely found their way onto the other guitars in the Gibson line? Let’s see what’s out there. There’s the very famous Keith Richards ES’s-a black 59 ES-355 (the one in the Louis Vuitton ad) and a white ES-345 which I think is a 64. There’s Alex Lifeson’s white ES-355 but that’s from the 70’s-a 76 I think. There’s a photo of dave Edmunds playing a black dot neck 335 but it has the headstock inlay in the wrong position and I don’t know if it’s factory black. In any case, these custom colors don’t come up very often and I’m always happy to see one when they do. Recently I’ve had two of them – both from ’66 and both done up with fancy bindings (including the f-holes) and gold hardware. The serial numbers are very close as well (two apart) and it’s possible, in fact likely, they were ordered by the same buyer. Interestingly, they both ended up in the hands of a gentleman in Southern California and then both ended up with me. 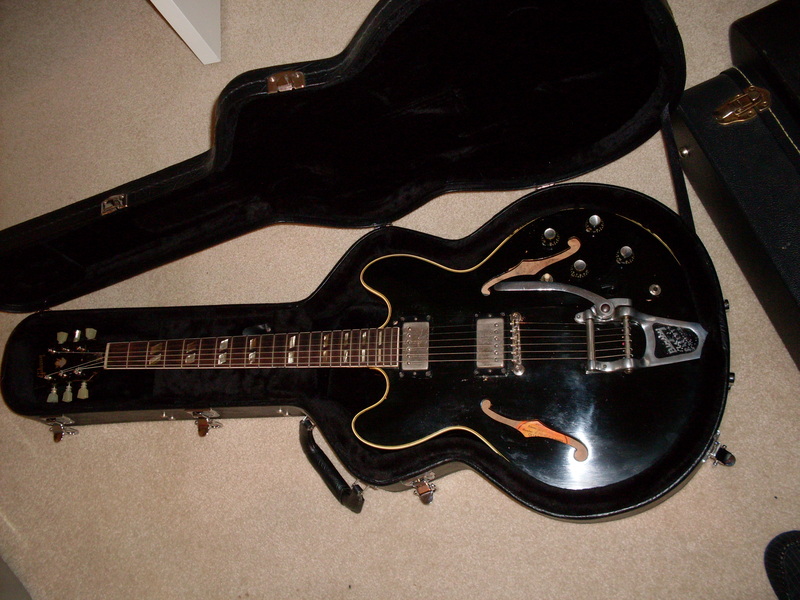 There’s a black ES-355 that’s been on Ebay lately with the same look. How do you price one of these? Well, it’s not easy given that the supply is minuscule and the demand is, well, there is no demand because most folks think they are totally out of reach. You can figure on a custom color being at least double the price of a red or sunburst of the same year. That doesn’t include “Sparkling Burgundy” which nobody seems to like very much. That also doesn’t include black or white (well sort of white) 335’s from the 80’s. They are actually worth less than their blonde counterparts. 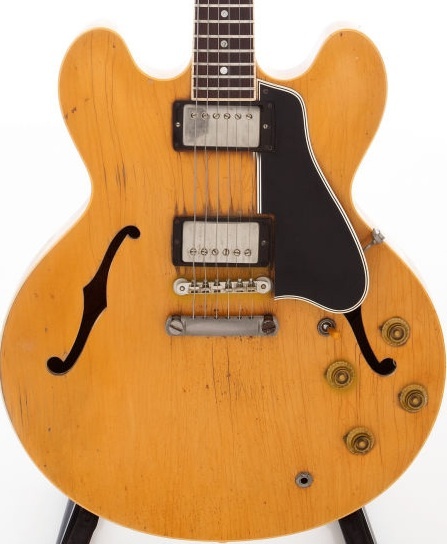 If you’re lucky enough to come up with a black or white dot neck 335 from 58-61, then all bets are off because you can pretty much name your price. There are some but I don’t think you’ll find one in your lifetime. Black 59 and 60 ES-345’s and 355’s were made but I’ve never seen a white one from that early. 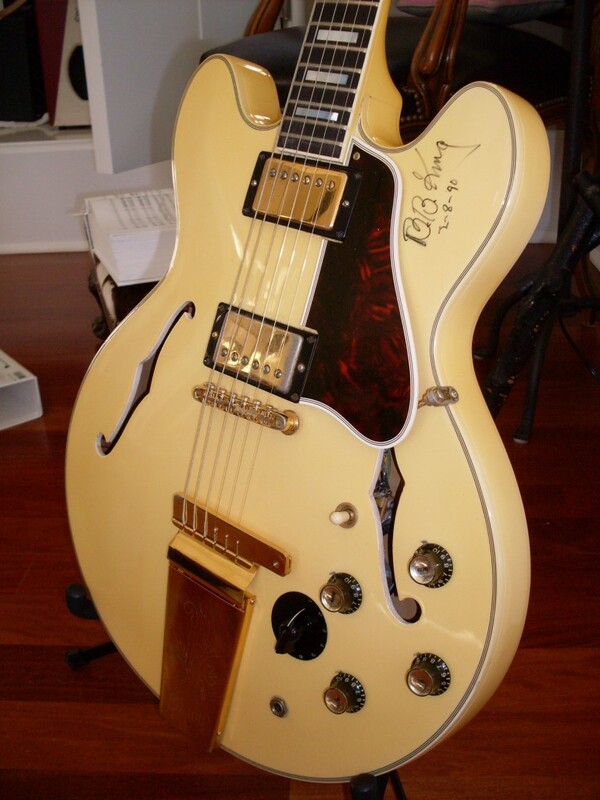 I had a white ’65 ES-355 a few years back and I mentioned Keith’s white ’64 ES-345. Then there are the Trinis. Who doesn’t love a black Trini? This 67 was pretty cool. I hadn’t seen one in ten years then had two of them last year. I’ve had a 66 and a 67 in the past year or so and I’ve seen at least two others including the one played by Rusty Anderson (Paul McCartney’s guitar player). But the Trinis were a standard factory color so there may be a lot more of them under beds and in closets. Pelham Blue was a standard color as well but rumor has it there are only 16 of them. I’ve had only one and seen four or five others. Still, a black Trini is going to cost you about double what a red one will cost, so standard issue or not, folks still will pay a big premium for them. The Pelham Blue Trini went for more like three times the cost of a red one but it was practically mint so you have to figure that in as well. There are some black ES-175’s, at least a few black Byrdlands and Kessels (Gene Cornish of the Rascals played one back in the day) and a few black early double necks (which are rare enough in any color). The tricky part is, of course, the “factory” part. 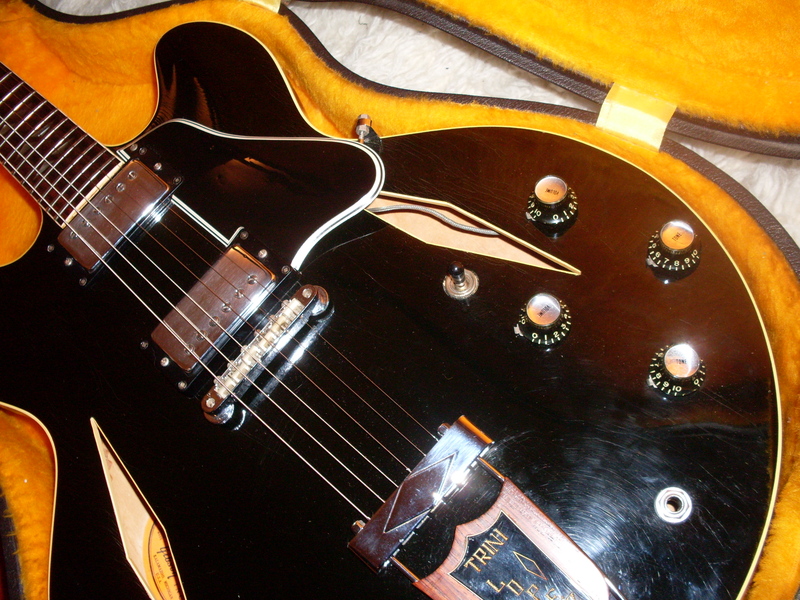 There are a number of ways to tell if a guitar was refinished and, frankly, a lot of black ES’s are not factory. Black can be used to cover all sorts of nastiness-headstock cracks being the usual sin but also filled holes and routs. I had a 68 Les paul Custom come to me that looked legit until you got the light to hit it just right and you could see that there was a Kahler rout that had been skillfully filled. So, be extra careful with these beauties. The paint is thick and opaque and sometimes it’s a little scary to imagine what’s under there. But if you find a real one, hang on to it (or sell it to me). There just aren’t that many of them and if they are cool enough for Keith, they are probably too cool for the likes of you (or me). This bound f-hole and 355 trimmed ES-335 (7 ply top binding and gold hardware) is a 66. 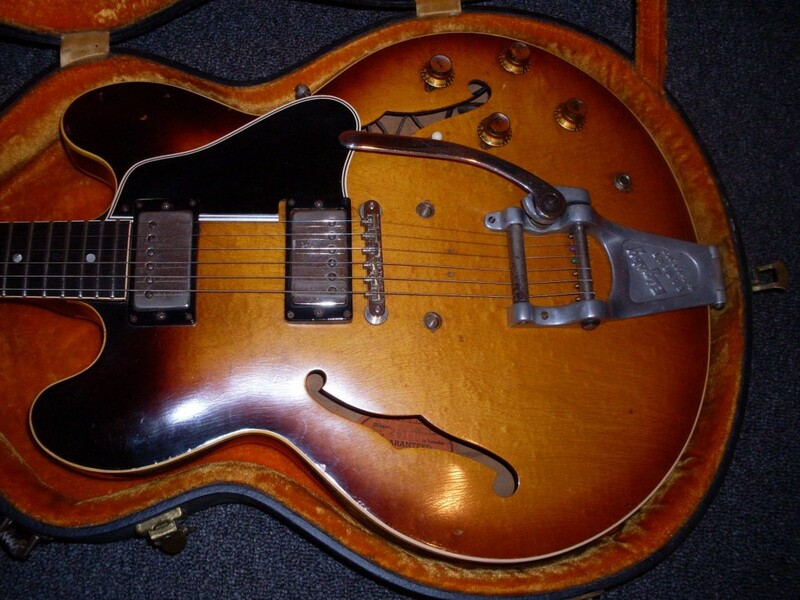 I had a 66 ES-330 decked out the same way only 2 serial numbers away from this one.